46.001 Bramble False-feather (Schrekensteinia festaliella) on Skircoat Green on July 30th 2016. Appropriately enough it was by the Blackberry and Raspberry patches which is what the larvae feed on. I almost didn't bother with it as it was very fly-like in flight and pretty small which probably explains why it's not recorded that often in Yorkshire. 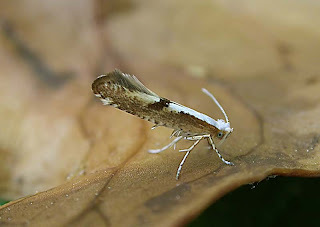 20.006 Juniper Argent (Argyresthia dilectella) in the garden, July 14th 2011. Captured by day. 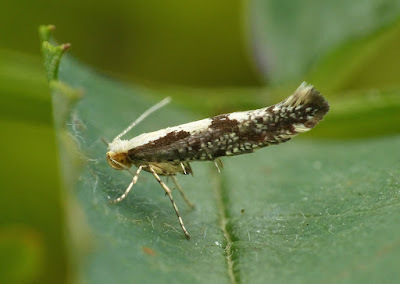 20.005 Triple-barred Argent (Argyresthia trifasciata) in the garden, May 8th 2011. Captured in the early morning. 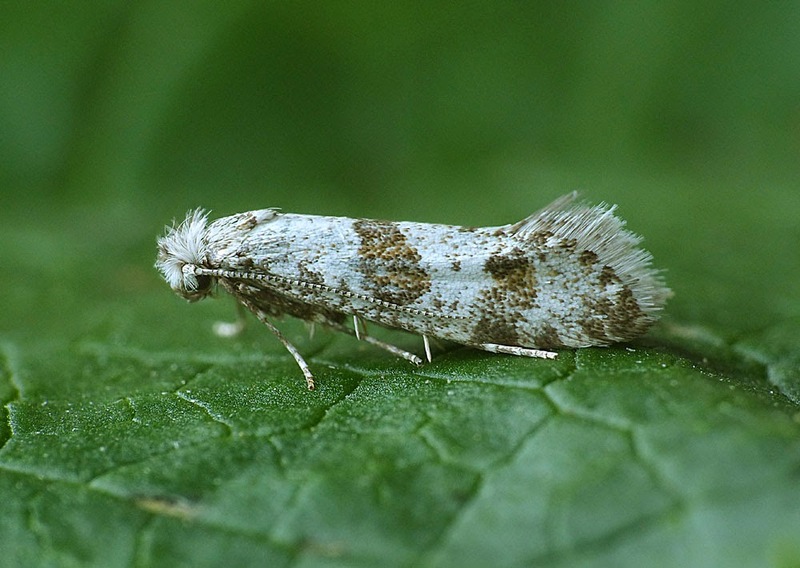 My first record was also in the garden on June 23rd 06 where individuals have been seen a handful of times since. 20.011 Gold-ribbon Argent (Argyresthia brockeella), North Dean meadow, June 15th 06. A field observation. 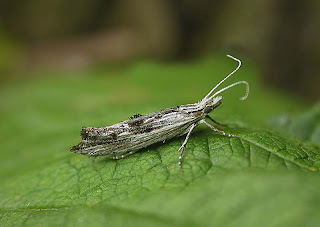 20.012 Golden Argent (Argyresthia goedartella), North Dean wood, July 10th 06. 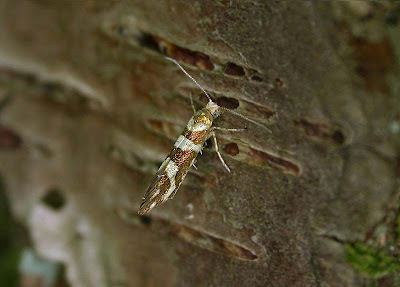 A field observation on birch just as the sun came out to illuminate the moth. 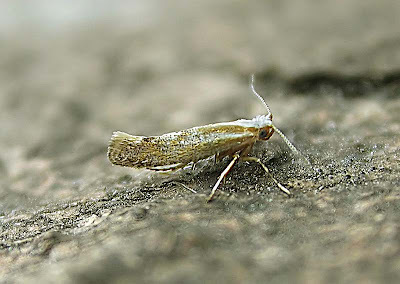 A commonly seen species. 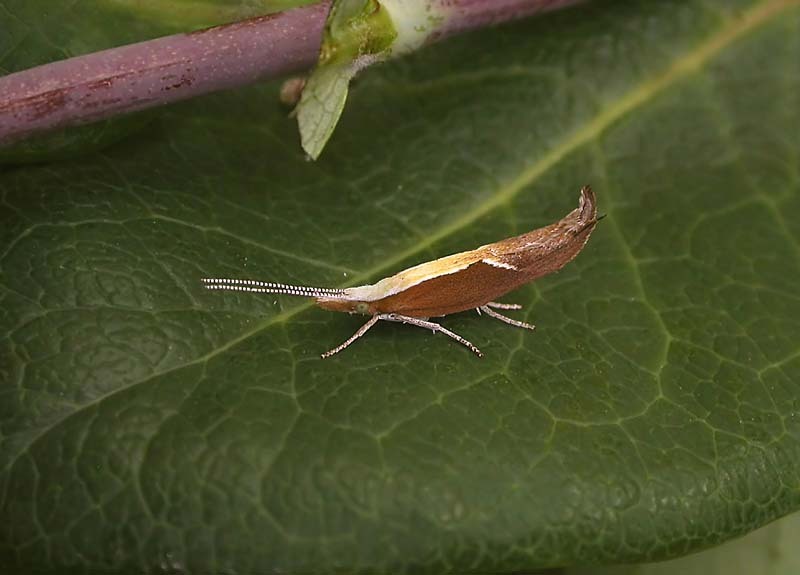 20.019 Apple Fruit Moth (Argyresthia conjugella) at Norland Bilberry Slopes, June 28th 2018. A field observation on Rowan. Practically every Rowan tree on the site had several of these either resting on the leaves or were easily disturbed by gently tapping the branches. 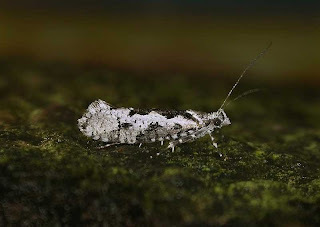 20.020 Brown Rowan Argent (Argyresthia semifusca), North Dean wood, Aug.31st 06. 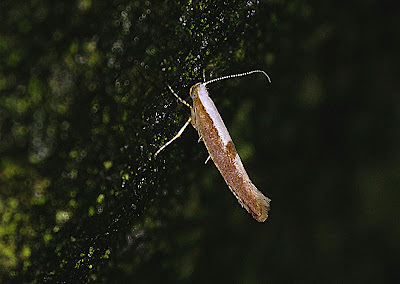 A field observation and my only record. The forewing has a delicate violet flush which just comes through in the photo. 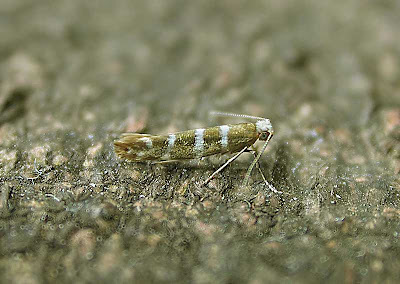 20.021 Cherry Fruit Moth (Argyresthia pruniella) on Arthur's plot, Skircoat Green allotments, July 16th 09. Captured by day. 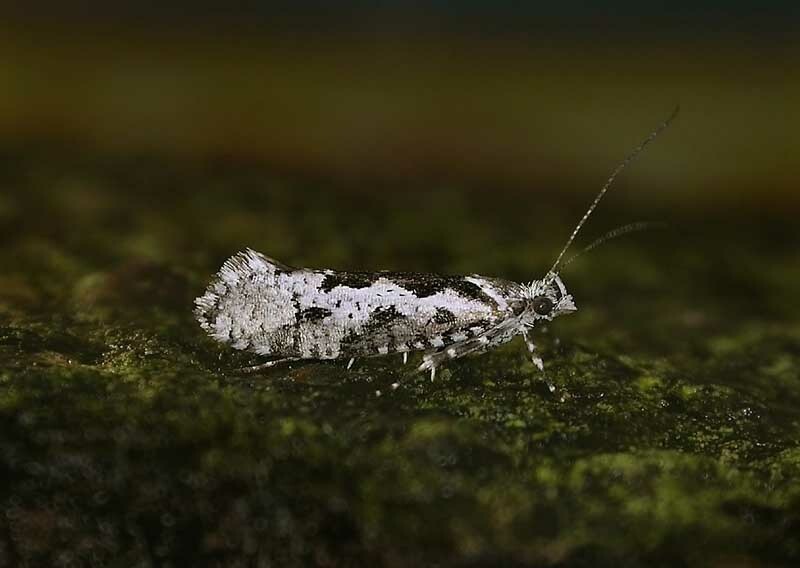 20.022 Hawthorn Argent (Argyresthia bonnetella), May 31st 2010. 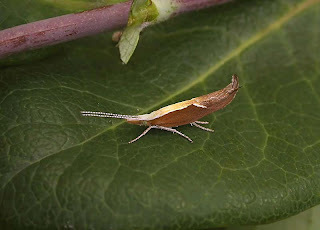 Reared from a larva spun up in Hawthorn near Sterne Mill bridge. 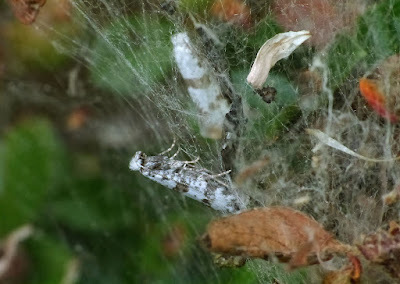 16.001 Bird-cherry Ermine (Yponomeuta evonymella) nest, Cunnery wood, July 5th 2014, originally found by Chris Sutcliffe. I decided to take this nest home to determine the species as there was some uncertainty about the tree's ID. With just a couple of larvae present I thought it shouldn't be to much of a handful! 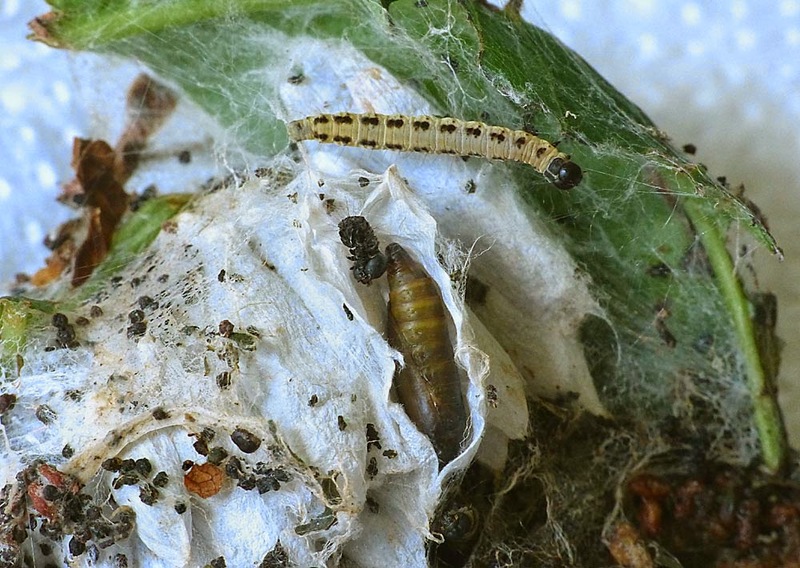 16.001 Bird-cherry Ermine (Yponomeuta evonymella) larva, pupa and pupal cocoons, July 5th. 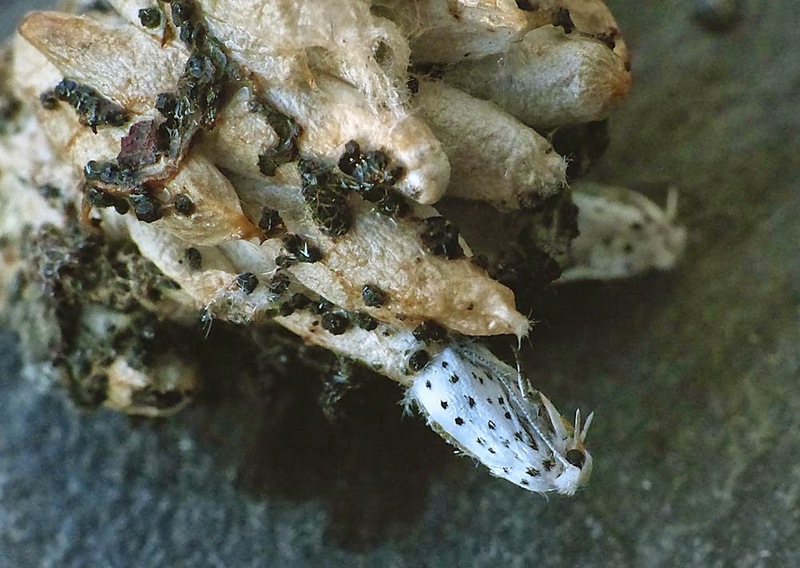 After opening up the nest I soon realised there was a central nucleus of many pupal cocoons. Opening one up revealed a healthy moth pupa, all bodes well. 16.001 Bird-cherry Ermines (Yponomeuta evonymella) emerging July 9th 2014. Three days later I was pleased that two adults had already emerged, but that didn't prepare me for the events of the following day when there was a constant stream of nearly 30 adults emerging from the "pupal hub". They were everywhere in differing stages of drying off. It was all a bit overwhelming so out they all went in to sheltered corner of the garden and left to their own devices. 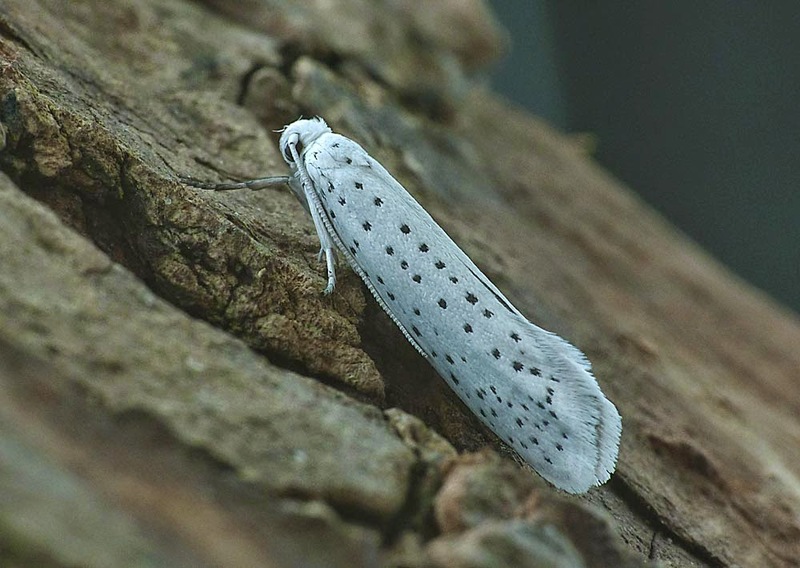 16.001 Bird-cherry Ermine (Yponomeuta evonymella) July 9th. The host tree was originally identified as a willow species but after the moths started to emerge it was soon clear that it could only be a Bird Cherry. 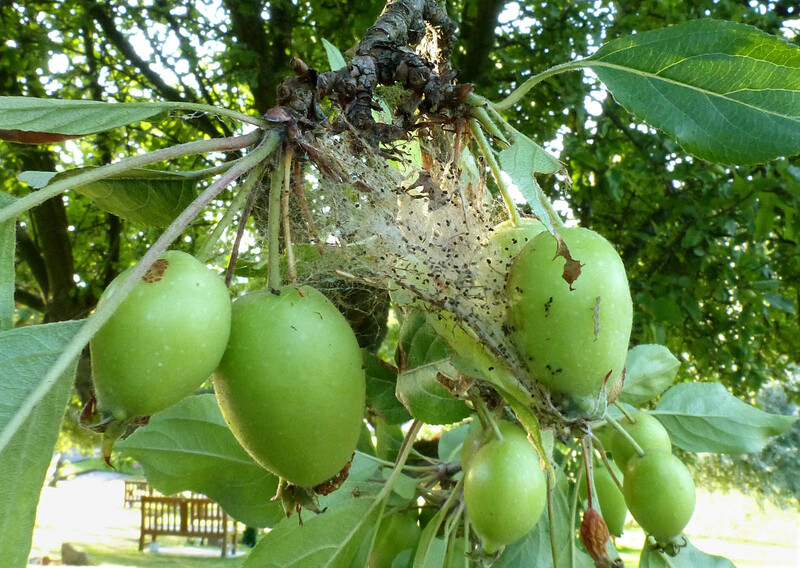 16.003 Apple Ermine (Yponomeuta malinellus) old larval spinnings on cultivated apple at Park Wood crematorium, July 18th 2017. 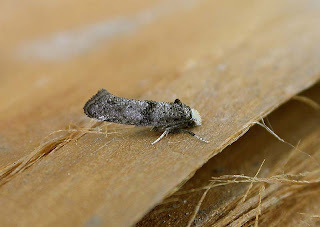 16.020 Hawthorn Ermine (Paraswammerdamia nebulella) on the garage, July 10th 05. Captured by day and my only record. 22.002 Ash Bud Moth (Prays fraxinella), feeding signs on Ash, by the towpath at Copley, May 9th 2011. 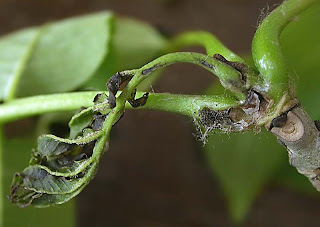 A withered leaf, feeding tunnel and frass are tell tale signs of larval workings. 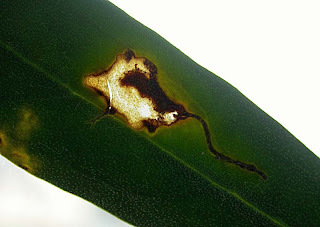 22.004 Olive Kernel Borer (Prays oleae), mine on an Olive tree, Newbank garden centre, West Vale, Apr.19th 2012. Just one mine was found on half a dozen small trees. No doubt imported with the trees from warmer European climes. Not recorded in Britain until 2009. 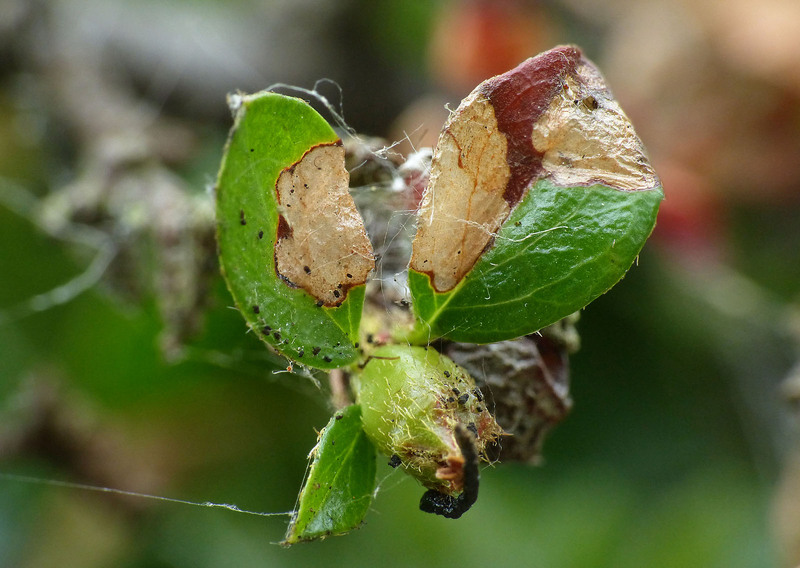 25.001 Hawthorn Moth mines on small leaved cotoneaster in the garden, June 10th 2017. 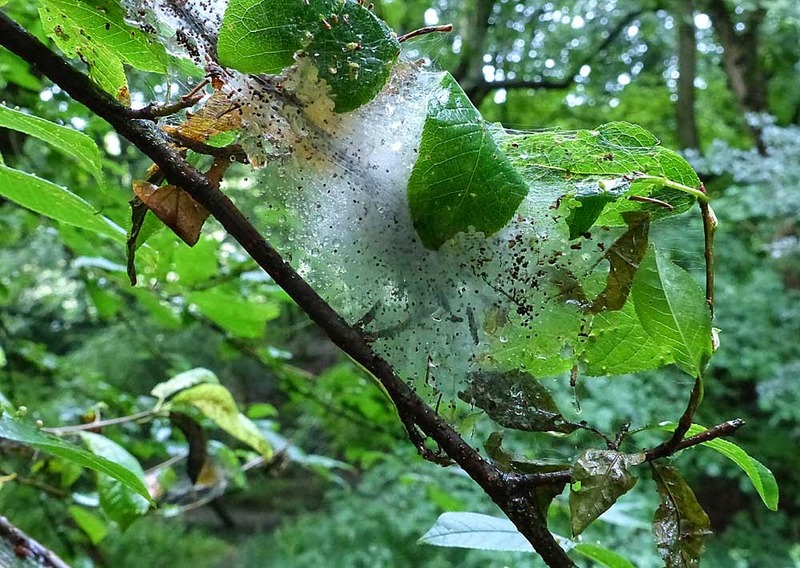 There were also a few webs this species dotted around the bush containing several larvae, pupae, emerging adults (see below) and parasitic wasp cocoons. 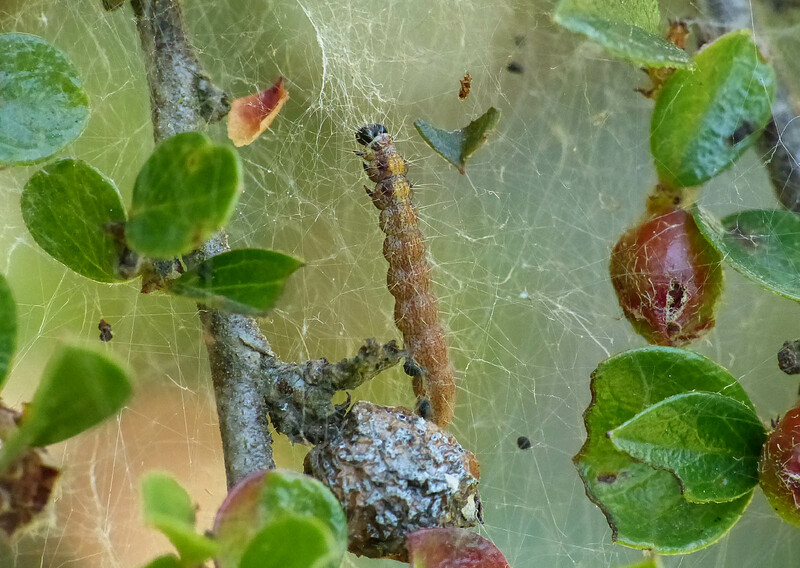 25.001 Hawthorn Moth larva June 9th 2017 (Details as above). 25.001 Hawthorn Moths emerging from webbing on the garden Cotoneaster, June 21st 2017 (details as above). 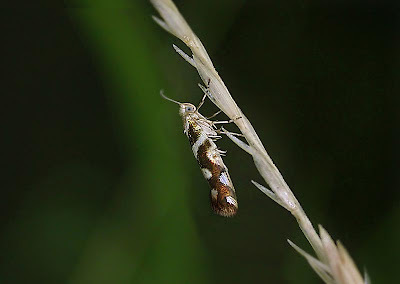 25.001 Hawthorn Moth in the garden, June 22nd 2014. Captured by day. 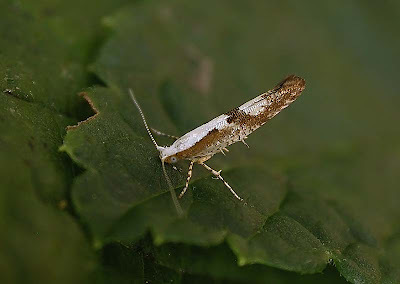 17.003 Honeysuckle Moth (Ypsolopha dentella), the garden, July 13th 05. Captured by day. 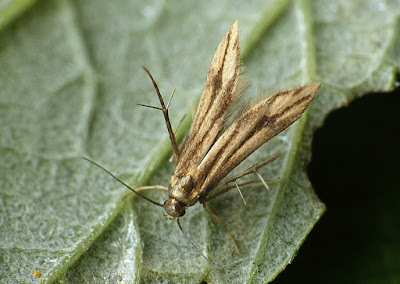 17.005 Wainscot Smudge (Ypsolopha scabrella) in the kitchen, Aug.2nd 2010. Captured at night, this is my only record. 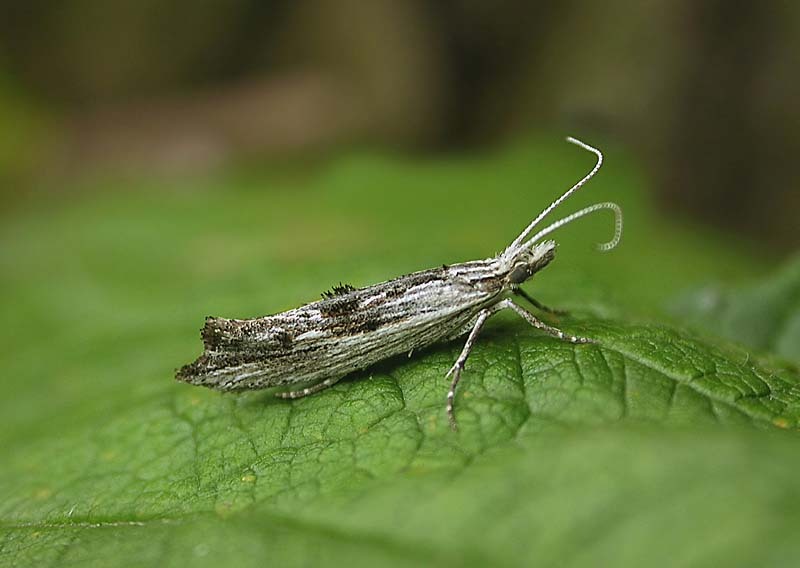 17.012 Pied Smudge (Ypsolopha sequella), North Dean wood, Sept. 1st 08. Captured by day. 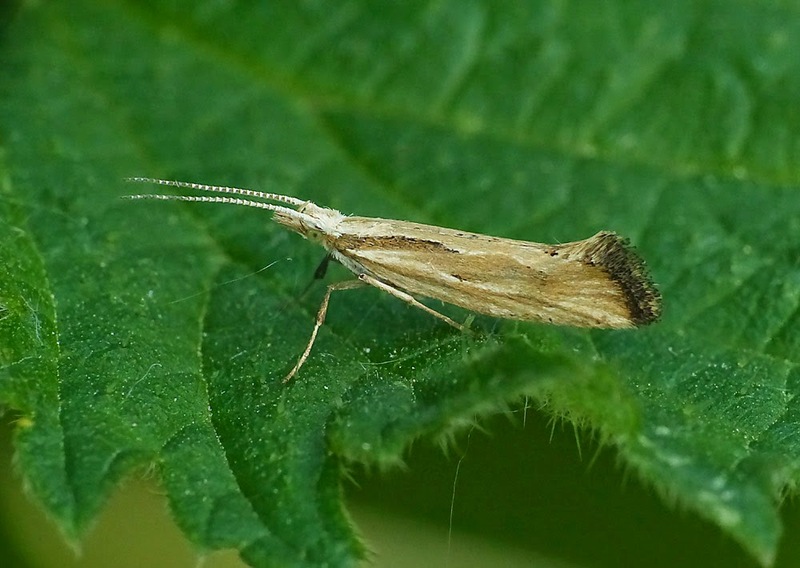 18.003 Grey-streaked Diamond-back (Plutella porectella) at the former sewage works at West Vale, May 21st 2014. A field observation on Common Nettle. Considering the large amount of the moth's foodplant, Dame's Violet, growing on the site it's not surprising to find this species here.